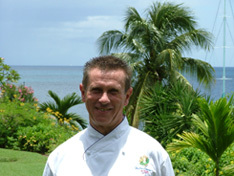 Chef de Cuisine of the hotel and Master Chef of France Francis Dulucq of Restaurant Le Chateaubriand at the Sofitel Bakoua in Les Trois-Ilets, Martinique, shares a few Caribbean secrets. While I was in Martinique in April 2006, I stayed at the Sofitel Bakoua and had dinner at Restaurant Le Chateaubriand, and after experiencing a "Taste of Martinique" I convinced Chef Francis Dulucq to share a few of his recipe secrets with me. Method: Scale the fish and cut into 4 filets, or have the fishmonger prepare the filets for you. Cook the filets and set on a plate, and serve with the sauerkraut, and a butter and lime sauce. Sauerkraut: Peel the papayas, grate the papayas and the onions, and put them in a pan with white wine, coriander seeds, juniper berries, salt, and bell pepper. Cover and cook for approximately 10-15 minutes and season to taste. Method: Peel the yams, slice, and then cut them using a round 9-cm diameter cutter to make them all the same size. Boil the yams with the curry until tender. Once cooked, remove them to a plate. In a large pan, bring water with salt, pepper, onion, garlic, and the celery stalk to a boil. Once the water boils, add the lobster and simmer for 20 minutes. (Do not boil, which will toughen the lobster.) Remove the lobster from the water, let cool, remove shell, and cut the meat into disks. Reserve on a warm plate. Crush the lobster shells. Cut the celery and onion into small pieces, and sauté with butter and the vegetables until golden brown. Add the crushed shells, add crushed garlic, and cook well. Flambé with the Rhum Vieux (aged rum). Add fresh tomatoes and tomato paste, the bell peppers and the cream. Cook for 20 minutes and then pass through a Chinois lined with cheesecloth. Correct seasonings to taste. Put a yam disk on a plate and a layer of lobster in a rosette form. Add a little sauce all around the plate, and serve while hot. Repeat these steps on the other three plates. Decorate according to your imagination. Peel the chayotes, wash and finely grate them, rinse again and pat dry. Create the mayonnaise by whipping the egg yolks together with the salt, pepper, mustard, wine vinegar and the peanut oil. Add the minced tomato and onions to the mayonnaise, season to taste and set on a plate. Peel the avocado and flavor with the lemons. In a pot, add water, parsley leaves, salt, lemon juice, sliced rounds of onion, bay leaves, pepper, thyme and bring to a boil, add the prawns. Cook the prawns in the boiling water for 5 minutes, drain, and then set them on a plate. Cut off the tails and cut the tails into pieces. Refrigerate until ready to serve. Presentation: Put a portion of the chayote salad on four plates, add the avocado and sprinkle the prawns on the plate. Read our article on Restaurant Le Chateaubriand in the Restaurants section and on the Sofitel Bakoua in the Hotels and Resorts section. Read other articles on Martinique in the Destinations section, Destination: Martinique - The Atlantic Side, Destination: Martinique - The Caribbean Side, Hotels and Resorts, Restaurants, Spas, Chefs' Recipes, Fashion, Gastronomy, Events and Liquor Cabinet sections.